The “Four P’s of Marketing” as we know are Product, Price, Promotion and Placement and these have been considered the primary pillars of marketing. The time has come to add another “P” that is, “Proximity” to these four pillars. Proximity Marketing is highly relevant to marketers and customers in today’s age. Proximity Marketing is rapidly altering the familiar face of product promotion and campaigning and is poised to remain a strong pillar in the marketing realm. The average consumer sees thousands of advertising messages a day, and in a fast-paced world, the only messages that get through are those that inspire immediate action. Beacons are creating exciting new opportunities to reach the right customers with the right offer at the right time, and the results are astonishing. In this post, we will discuss some brands that have implemented beacons and have gone on to impress customers with their sharp marketing acumen. McCormicks Zatarain’s brand is the first CPG brand to leverage iBeacon enabled apps to deliver special recipe content and product finder information when shoppers walk into grocery stores. The campaign enables shoppers to receive iBeacon-triggered grocery list reminders, recipes, loyalty points, and coupons directly from the brand while inside the retail location. The results of the Zatarain’s iBeacon campaign have been promising. Split tests conducted during the campaign have shown dramatic lift in purchases and engagement at beacon-enabled locations. Beacon notifications are delivered to shoppers through the company’s own CheckPoints rewards app and List Ease shopping list app, and are also available through partner apps that implement the platform. This implementation and its promising results show that offers or discounts are not the only things beacons can be used for, as long as customers are engaged and can see value in the engagement, they will opt-in! Hudson’s Bay Company (HBC), which owns Lord & Taylor, Hudson’s Bay and Saks Fifth Avenue, has rolled out beacons at select U.S. and Canadian stores. The store has deployed beacons with individualized campaigns for each department, which makes the customer experience interesting and focussed. In certain departments, customers receive a coupon offering up to 70% off certain items with a specific “reveal code,” which can be used to track beacon effectiveness. What is really interesting is the fact that – rather than using its own app, Lord & Taylor is tapping into third-party apps. Many retailers already found that most of their mobile shoppers shop more heavily on their mobile websites rather than the store’s app . By using third party apps, Lord & Taylor increases its chances of consumers having the app loaded, which is a current, high-bar requirement for beacons to be effective. The first app being used for Lord & Taylor beacons is SnipSnap, a nifty coupon app already on the phones of a few million people. For the Hudson’s Bay stores in Canada, the widely used Hudson’s Bay Gift Registry is being used. The reviews from customers for this particular implementation has been encouraging. iBeacon technology’s biggest convert so far has been Major League Baseball, which implemented beacons in 28 of 30 ballparks. Bill Schlough, the chief information officer for the San Francisco Giants, says check-ins by fans using the MLB’s ballpark app more than doubled after the app began using iBeacon to help push merchandise coupons and seat upgrades. MLB worked with Apple to integrate the iBeacon indoor mapping technology in iOS 7 to customize its ‘At the Ballpark’ app in order to provide app users with an interactive game watching experience at the stadium. For example, when a user who has loaded the app, is on his way to the stadium, the app identifies the stadium he is enroute to and starts populating information specific to that one. Once he is near the entrance, it displays the barcode of his ticket and directs him to his seat via a map while highlighting the nearby points of interest. If he had purchased his tickets online using Apple Passbook, the app even pulls them up automatically. The MLB app is now adding short, location-specific videos on the history of stadiums. This was a first for stadiums as far as beacon implementations in stadiums is concerned. This is the most popular beacon implementation in a museum so far, and has become an example for other museums to follow. The biggest issue museums have faced for long is finding ways to enhance the visitor experience. Beacons provide an opportunity to create a fusion of physical and digital content, in compelling and visitor-friendly ways. From guided tours to mobile guides, museums can now complement the visitor experience with additional resources and to engage, entertain and educate us through layers of additional content. Encouraged by the success of Rubens meseum’s beacon implementation, Prophets and Museum Antwerp are now studying the possibilities that open up via iBeacon technology for all of Antwerp’s museums. The application offers many advantages: you can offer individual guided tours by theme, make a museum visit more interactive for children, and display extra information or artworks that are not located in the museum. Proximity Marketing is highly inexpensive when compared to all other marketing channels and provides businesses with unlimited opportunities. With real-time data analytics using beacons, the review cycle for a campaign’s success has become swift. 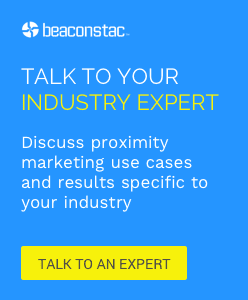 So far, beacon implementations have shown better conversion rates than conventional marketing efforts. Proximity marketing is thus, the way to go for marketers – if they really want to surprise and excite customers and create a better brand value for themselves.